The Lakehouse is an Absolute Lakefront, five bedroom, three bathroom property within walking distance to Central Queenstown! With a Spa pool/Jacuzzi to unwind in at the end of the day and a Jetty to tie the boat to – everything is ready for your holiday! 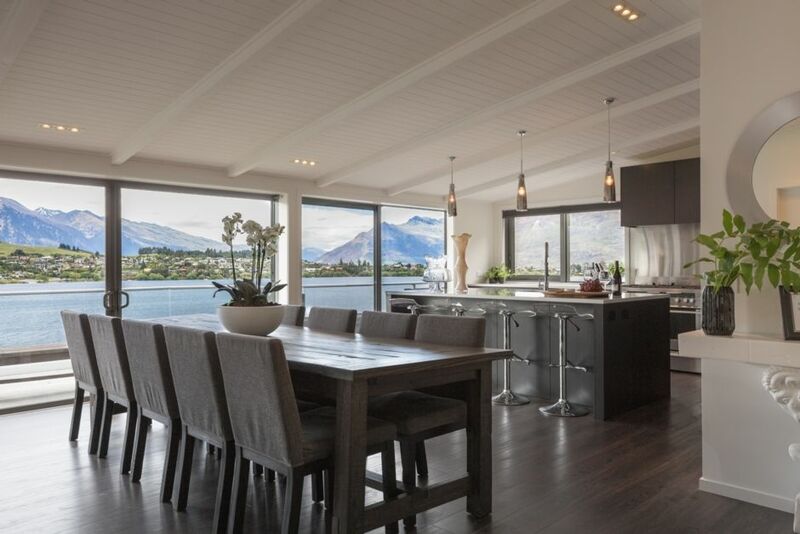 Enjoy the spectacular views.... the house is set amongst mature trees with unobstructed iconic views of Remarkables Mountains and Lake Wakatipu. Stroll through the front garden and straight onto the Frankton Walking Track. A leisurely 20 minute walk along the track and through the botanical gardens will bring you into the heart of Queenstown restaurants, bars, cafes and attractions. Should you choose to drive its only 3 minutes into town. Upstairs Bdrms 1 and 2 are each fitted with super king beds. Bdrm 3 includes 2 king single bunk sets. Downstairs, Bdrm 4 and 5 both have queen beds. We provide luxury bed linens, quality feather duvets etc. This spacious home is a great option for extended family groups and couples, with 2 bathrooms upstairs plus 1 bathroom downstairs. The designer kitchen is well-equiped with granite bench tops, stainless steel appliances and paneled white timber ceilings. Serene decor and oversized sofas in the living room offer the ultimate in relaxation. This is a popular and much loved vacation home with wonderfully appreciative feedback from our happy guests. Many reviews have been handwritten into our 'in house guest book' plus many 'on line' reviews across a variety of booking websites. *Bond of $1000 payable prior to arrival. *3 hours cleaning charged per booking. Additional cleaning or excess rubbish removal will be deducted from your bond. *If your group is under 25 years of age, please contact us to discuss. We ask for ID on arrival. *Do not misrepresent the number of guests in your group, we require to meet each guest. Close to town but away from the hussle! Close to town but away from the hussle!!! Fantastic access to lake front, large comfortable beds! Kitchen has all the luxuries of home. Couldn’t recommend higher. The house is in a great location, easy flat walk into town, a short 2 min drive into town and about 10 min drive from the airport. The biggest drawcard is the incredible view of the lake and mountains. The house is well appointed with comfortable beds, nice sheets and towels etc and all the mod cons in the kitchen, laundry and bathrooms. There was more than enough room for our extended family. We would happily visit again. Beautiful place to stay with a large group, plenty of room and close enough to town to walk along the lake. All my family were thrilled to stay here and it completed their first trip to NZ in style. Exactly as described and the view was wonderful. Stunning property, fully equipped, luxurious bedrooms. Stunning property, fully equipped, luxurious bedrooms. We loved that there was a lower level with its own views and lounge for a bit of space and quiet. We were all blown away with the quality of this accommodation. We were all blown away with the quality of this accommodation. Great location, spectacular views, beautifully fitted out, and immaculately clean. The spa pool is dangerously good - we could have stayed in all day! And the beds are sooooooo cosy and comfortable. Normally on girls weekend's we go out a lot but this house was so fabulous we ended up staying in! Thanks for a fantastic weekend!! What an amazing place (particularly that view over the mountains and lake). What an amazing place (particularly that view over the mountains and lake). We had a truly fantastic time and are very thankful for your kind hospitality.